Not much happening here. 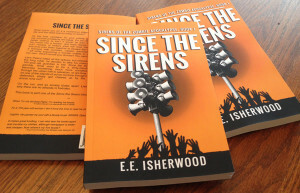 I’ve been busy on other sites, including my latest at http://zombiebooks.net. I’m writing about zombies that invade St. Louis! First off, I am the consummate weekend warrior. I don’t pretend to go to a race to take the podium, nor have I ever come close LOL. You can find me towards the back of the pack and I’m perfectly OK with this. I go to these things for the sense of adventure and accomplishing them. My goal was to ride strong and enjoy seeing new trail for 50 miles! My training this past winter consisted of going to the gym several times a week, mainly to run the track or spin on the bikes for 30 minutes. I absolutely hate spinning so I prefer to run as much as I can. When the weather got nicer this year, I took to running outside and of course started to ride my mountain bike when appropriate. One big problem I encountered was an extremely wet April, and not only did I seldom get out on the bike, I wasn’t running as much as I wanted. Long story short, in the run up to the May 14 race, my training seriously plummeted instead of ramping up. I never got a ride in of more than about 10 miles this spring. Trouble ahead! Even with these problems, I went into the race feeling really fit and mentally prepared – which is often as important as the physical. I had a brand new bike – Salsa Spearfish – and was excited to take her out on her first race. Took the 5 hour drive on Friday afternoon, found my campsite Friday night – too late to pre-ride anything -, and settled into a horrible night’s sleep. Woke up feeling the usual nervous energy of a big ride, but nothing really serious. Ate a banana, some yogurt, and a grain bar as soon as I woke up, giving it about an hour to digest before the race. Loaded my gear and headed to the start line with the other 200 racers. The singletrack starts with a tangled mess of slippery rocks that is likely ridable when dry, but only just. It had rained a couple days prior and everything was still drying out, but not dry. Each rock was slippery with the mud of the previous riders and something about the rock there makes them as slippery as ice when you try to ride over them. Everyone was walking their bikes through these sections and it was hard to judge distance alternately riding for a bit and then walking for a bit – but perhaps a full half mile of the first 7 or 8 mile stretch was spent walking, at least for me. I got a major quad muscle cramp in this section, which is super rare for me. I took some Hammer Endurolyte capsules and removed that threat immediately, but this was just the beginning of my problems. I’m not sure why, but about 45 minutes into the ride I started to feel sick to my stomach. I was using my usual Hammer products for in-race nutrition and I’ve never had problems like this before, so I don’t think they were to blame, but something was making me feel bad. At one point I had to stop, thinking I was going to unload my stomach on a fellow biker LOL. This passed after a bit, but I felt “off” for a good long while in the morning. Then another problem popped up which I didn’t expect; my bulletproof Camelbak which I’ve used for years without incident decided to take a dump this day, and the end-cap popped off and it started spitting my water out all over the place. I knew I’d never find the missing piece so I let it empty out and had to rely on the one drink bottle I was using on the frame of my bike for the rest of the day. It felt like an eternity reaching the first checkpoint (mile 15) but I chomped on some oranges, refilled my water, and was on my way. Spent only a few minutes there. 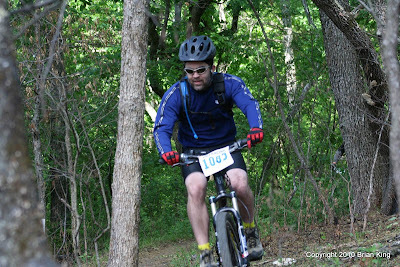 The next section (Green Loop) was much faster singletrack and at least temporarily I was out of the wet rock sections. A few miles of this brought us back to the Orange Loop which was again a mix of fun singletrack and awful walking and mud pits. My bike was a gory mess already. At this point between checkpoint 1 and 2 I was actually starting to think my day was done. A combination of unsettled stomach, unexpected amounts of walking, and rumors that we hadn’t even reached the hard part of the trail conspired to make me think bad thoughts about giving up. I’ve never given up on any bike race or even a recreational bike ride, so giving up was foreign to me – though it really sounded good at this point. As I left Orange Trail for Blue trail, I hit some really nasty rock gardens going downhill that I chose to walk due to how slick they were. The only other place I can recall encountering slick mud like this trail was in Hawaii. If I had to pick either though, Arkansas would win hands down as a better place to ride no matter how bad the mud… I reached the bottom of Blue and ran into a friendly rider who seemed to be on the same pace as me since we’d passed back and forth all day. He said this was his 6th time doing this race, and that it would likely be the first time he didn’t finish. We looked at the clock and the cutoff times for checkpoint 3 and figured it was beyond reach. But an odd thing happened in the next 30 or so minutes. As we pulled into checkpoint 2, the staff said we had 2 hours to reach the final checkpoint before we’d miss the cutoff. We had 26 miles done (5 hours in the saddle so far), and it was “only” 9 miles to the next CP, but contained the worst climbs of the day. I was beat down, my bike was caked with mud and my gears sounded horrible, and while my stomach had returned to normal my energy level was ebbing pretty low. In talking to my riding friend, he said what would likely happen is that we’d arrive too late at CP 3 but that we would at least be able to ride that far. But, after reflecting on the crappy ride that I was having so far and realizing that if I didn’t finish this today I would likely feel compelled to come back and try again – I resolved to give it everything I had to make it in time for the cut off. I had a purpose, a goal, a mental target again. I was off. This section WAS pretty hilly, and I did do a fair bit of walking despite my zeal. One section was so steep it went up man-made steps through a notch of rock. 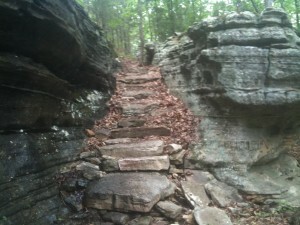 But all in all, I was able to maintain forward momentum and push myself through the worst of the climbs. Even this nasty section had a fair amount of level riding and even some downhill. The miles ticked away, especially the final few miles which were rolling singletrack. In my head I recalled the story of a previous rider of Syllamo’s revenge who posted his ride report afterwards – he bailed out his first year – and he said he regretted it for the whole year until his second try in which he succeeded. I’m trying to find the link to his report. That guy helped inspire me to push it. I pulled into CP 3 with about 10 minutes to spare! Victory would be mine. 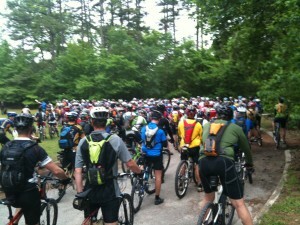 The last section of trail (Red Loop) is dubbed the “fun” section of this 50 mile affair. It is fast, rolling singletrack through majestic pine forest – which reminded me of riding in Colorado. Very sweet indeed. Even so, I spent a good portion of my reserves pushing hard to make the cutoff and now I was dragging horribly on anything but actual downhill. There were no longer many riders doing the 50 mile race – most were already well finished and probably heading home by now. The few guys I did see were taking it easy like me. However, there was another group of riders who were doing the 125k race and those guys were blowing by like they were fresh. Really impressive to witness, and every single one was very nice with words of encouragement as they whizzed by. Hats off to those guys (and gals). Easy or not, that was the longest 15 miles of my life. When I finally reached the last descent back down the fire road I was so happy because I knew even a mechanical failure couldn’t stop me from finishing. Pedaling down to the finish line was a breeze, and the few people remaining gave me a nice welcome. I was immediately off the bike and over at the food trough loading up on spaghetti and salad. Yum! Bottom line was that victory was mine. Not a podium of course, but I beat down the quitter in me and managed to maintain forward momentum no matter how tired I was physically. Racing against the weaker version of myself helped me emerge from this thing knowing that I can conquer almost any challenge. On my sliding scale of “most difficult things in my life” I think this race probably takes the cake. I was on the bike for 9 hours and 30 minutes. A good portion of that was spent pushing my bike (I wish I had a way to measure that) up hills or through mud pits. By comparison I did a 75 mile race in Wyoming (Laramie Enduro) which at the time I felt was the hardest thing I’ve ever done. However, looking back that race was easy in comparison because you could go downhill for miles and miles in some spots. It also lacked mud and never once did I slip on muddy rocks (although ironically I fell into a mud pit!). A close third on my list of difficult bike rides was doing one section of the Colorado Trail where we carried our bikes on our backs for 8 solid miles, mostly uphill. We then rode another 40 miles. As hard as that was, I think I’d rather do that again before I’d do a muddy Syllamo. As to whether I’d do this again under any circumstances I think that time will tell. Today, this minute, I don’t think I’d invest the time and effort riding it again. 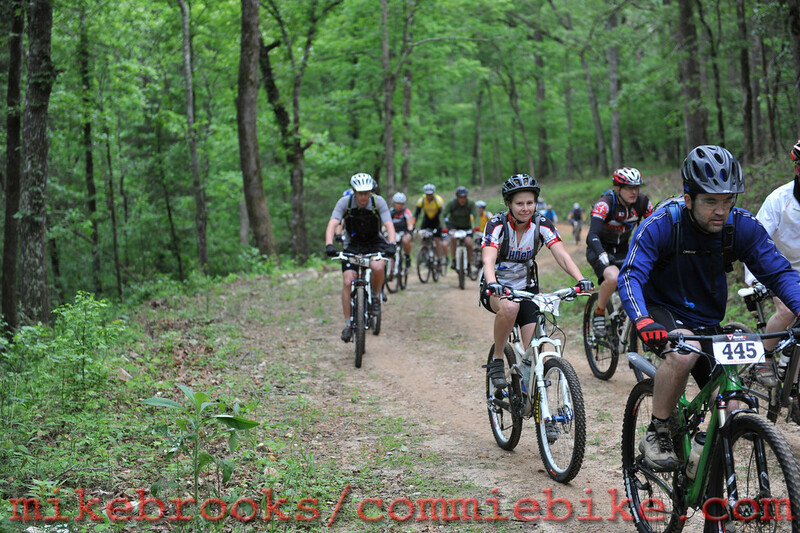 It is well run, the volunteers and staff were awesome, and the area of Arkansas where the race is held is beautiful. As races go, I have no complaints. As trails go however, the fun factor was sapped by the mud and rocks to a point that I can honestly say I wasn’t having fun for most of the day. It’s fantastic that I finished it as I don’t feel compelled to go back there to prove I can complete it, so maybe I’ll just leave it at that. In 2004 I said I’d never do the Laramie Enduro again either…and I’d LOVE to do that race again – so who knows. The main thing I learned about long rides in general is to carry chain lube in muddy conditions. My chain sounded like it had coffee grounds in it as I rode the last 25 miles or so and at times I really felt like the whole drivetrain was going to blow apart. The CPs had lube, but so many people needed it that by the time I made it to each one they were empty. A small detail to be sure, but an important one that might have helped smooth out my late day grinds. Special thanks to Weider Nutrition, my awesome sponsor! For my own resource, I’m posting links to all my important software which is open source. OpenOffice – An application every bit as good as MS Office for MOST things. Digsby – IM chat client that links up with Facebook, IRC, ICQ, and most/all major IM clients. Araneae – Basic text editor. I prefer version 4, but they are up to version 5. Muziic Player – Standalone MP3/Audio player. I got sick of WinAmp being such a hog and always needing updates. IrfanView – Image batch resizer. This program does one thing very well. It takes directories of images and resizes/renames them. Handy for digital camera pictures. FastStone Image Viewer – An ACDSEE clone. As best I can tell it does just as much, but is free. Screengrab – A nice Firefox add-on which creates a jpg of an entire webpage, even if it is too tall to fit in your browser window. Web Developer – A must have add-on for FireFox which provides numerous tools for working with web pages, seeing code, CSS, etc. 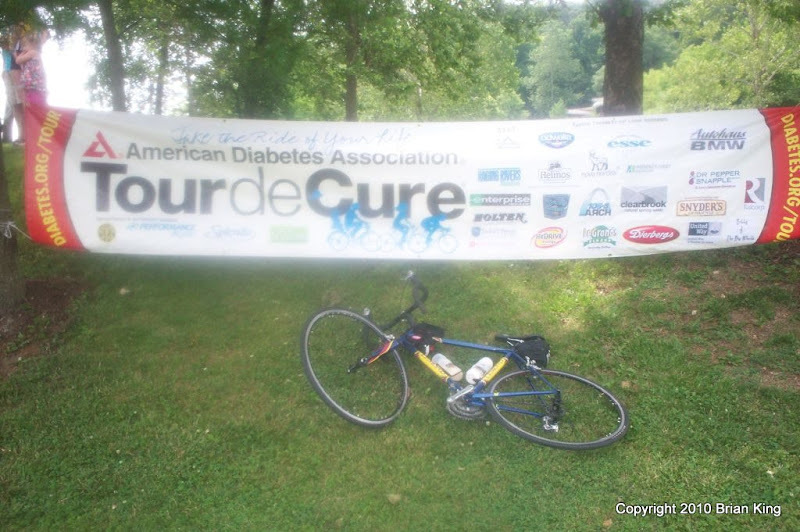 The 2010 Tour de Cure in St. Louis was only recently put on my radar as something I wanted to do, and up until a few weeks ago I didn’t even have a road bike to ride it. But, over the winter I had been training very hard to get into better shape for my spring/summer mountain biking, and somewhere along the line the bug bit me to do a long road ride like this – 100 miles to be exact. So, with two training rides of about 50 miles under my belt I headed to Grafton IL to give this a shot. I had no doubt I could sit in the saddle for 100 miles but any number of things could have happened to stop me from crossing the finish line. Fortunately, this story does have a happy ending! I gave myself an hour and 45 minutes to reach Grafton before the start of the race, and to my shock it took exactly that amount of time. I started to unload my bike just as the main group of 100 mile riders left. So much for taking pictures beforehand! I moved as fast as I could to get all my gear together and started after them, probably 10 or so minutes later. As it turned out, that would be the last time in a hundred miles that I would see that group. My first goal was to find a group of riders in a pace line so that I could tag along, and for the next 10 or so miles I bounced around a few groups trying to find a speed I could live with. By far the fastest section of my day, I cruised along fairly quickly on this stretch as it was cool and shady (the sun stayed in the clouds almost the whole ride) and I was fresh. Because the main field was up ahead though, there weren’t many organized groups trailing behind like me. This meant that most of the day was spent riding alone or in small disorganized clusters. The Kampsville ferry was the highlight of the small town of Kampsville, IL and the 5 minute crossing gave me just enough time to snap a photo on my iPhone and upload it to Facebook. The rest stop was on the far side, and I stopped again before heading out onto the somewhat busy section of highway running between Kampsville and Hardin, IL. This was a tough 10 mile stretch, as we were now about 30 miles into the ride. We crossed the bridge at Hardin and made our way to the next rest stop. I was only here for a couple minutes when my cousin came riding up. He also got a late start and was in a hurry to get back on the road. We chatted for a minute or so and then he was off and gone. Lunch was served in Kane, but a sandwich didn’t really appeal to me so I ended up eating a bag of chips and a banana just to give myself a little variety. After a few minutes of rest and a refill of water, I was back out on the blacktop. This next section I was feeling better, because I remember thinking so, but I can’t really recall much of this section of the ride until the end when we were skirting the edge of Jerseyville, IL and there were houses and such rather than cornfields. The next rest stop was at the City Park and was well stocked with nice volunteers (all of the rest stops were, it just seemed like this one had the most!). A quick rest and then off again! The next section weaved in and out of the town of Jerseyville and I only remember snippets of this section — I think everything runs together when everywhere you look is a cornfield — including my only negative run in with a vehicle the whole day. A young kid in a red pick up yelled at me to get off the road. Apparently having 10s of miles between himself and the next vehicle plus me was just too much traffic. In fact on this section I can’t recall seeing hardly anyone else on a bike. Miles were thinning out the riders to the point of extreme. The desolation ended at the next rest stop, which had all the usual goodies and nice folks. They said we were getting close to the end! Only 15 short miles to go! The next section was along another fast section of highway and I pushed pretty hard here so I wouldn’t have to be on it any longer than necessary. I think I passed one rider over the 4 or so miles until the next turn off. Once back onto the country roads I didn’t see anyone until very near the next rest stop. At one point I was on a straight piece of farm road and I could see in back of me and in front of me as far as I could and didn’t see any other bikers. I rolled into the last rest stop of the day to one of the most vocal stops, with a nice group of volunteers giving a rousing cheer to each new biker. It was a nice gesture given that we were well behind the main field and coming in by ourselves. This rest stop was the main event of the day, though I missed the bands, probably by a couple of hours. The end of ride was almost just around the corner, and the only big hill of the day was a fast descent off the bluff into the town of Elsah, which is just a couple miles from the finish line. 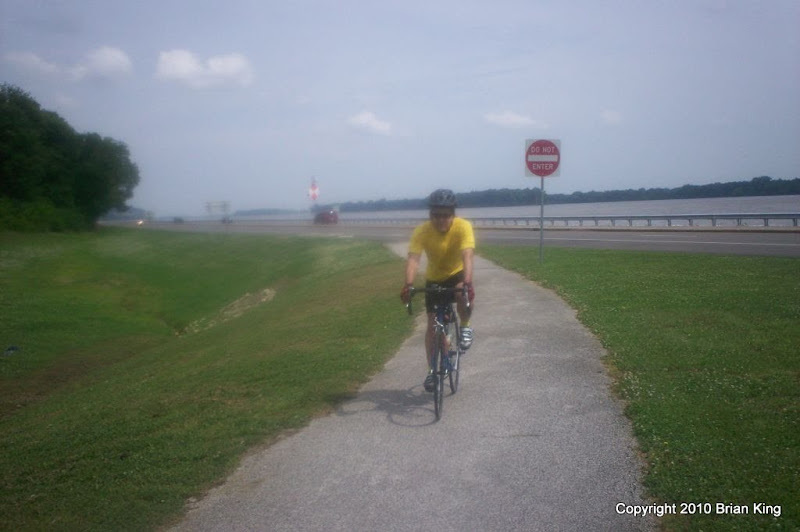 The last mile or so is along the Mississippi River and is quite nice. The finish was a bit anti-climatic. There was a tent with some nice volunteers cheering for all the late arrivals and a few riders were still hanging around the area having chow. Otherwise, you’d hardly know you were finishing a 100 mile bike ride. Not sure what I was expecting. I was done – that is all that mattered I guess. The thing that surprised me the most about the day was how much pedaling was involved. I know it sounds terribly obvious, but I figured there would be sections of up followed by sections where you could coast for a bit and catch your breath. It turns out that except for the very last hill (which lasted about 60 seconds), almost the entire course was flat enough that pedaling was required even on the gentle down slopes. I never doubted that I could finish the 100 miles, but I was surprised that it took me a full 8 hours of pedaling to do it! This put me at about 12.5 miles per hour, which seems rather slow for a road bike – but with 9 rest stops I guess it adds up. Next time I ride 100 miles I’m sure I can do better. It gives me something to aim for. My nutrition plan was mostly intact. My Hammer Perpeteum worked the usual wonders, and I paired with with Endurolyte caps by Hammer, which prevented any leg cramping. When I finished the race I was definitely fatigued, but not exhausted. A couple recovery drinks and I was good to go for the drive home. The next day my legs felt tired, but weren’t in any pain. I credit this to good nutrition! Thanks to all who donated to the ADA in my name so I could ride this race. I’m proud to have helped in some small way to fight diabetes and I’m looking forward to doing it again next year. One of my bad assumptions was that I could take it easy at the start since the group would probably be bunched up for a while and that fighting for position early on didn’t make much difference. I figured that I could catch people one some of the technical portions (I pre-rode the course so knew what to expect). This assumption was instantly shattered when I realized that since I was in the beginner class, there was a large disparity in skill level between the guy who got to the first big downhill first, and those who got there later. It turns out that since I arrived bunched up in the group, I was at the mercy of the slowest rider on the downhill – and was unable to safely pass. This slowed me down so much that the next age group caught up with us before we reached the bottom of the first hill – and they started a full minute behind us! I would say I easily lost a minute or more within the first mile. My next assumption was that I would be able to catch people on some of the technical sections, and this was true to an extent. There were a lot of guys walking sections, and I was able to ride past them, but this wasn’t as big an advantage as I figured because the main field of my age group was so far ahead. The trail itself was stellar. Lately refurbished by GORC (Gateway Off-Road Cyclists), the initial 6 miles or so are all flowing single track, reminiscent of some of the best (flatter) trails in Colorado. Never too steep on the ups or downs, it generally flows in and out of the hills and at times opens up into bullet train fast sections of nearly linear trail. If you aren’t smiling on this trail, even in a race, you aren’t alive! The last 1/3 of the loop is a fire road with a nasty climb out of the valley. It isn’t overly difficult, but does require grinding pretty seriously for about a mile. The loop ends with a wide section of double track that is pretty smooth and easy…making it very fast. I placed 11th in my class (out of 17 riders) which I feel was about what I deserved. I rode strong, felt pretty good throughout, and can’t complain too much about anything since this was my first race. I was just happy to learn how things work, get a feel for where I rank generally in my age group, and I’m looking forward to the next race to see how I can improve my time. The winner of my age group finished about 10 minutes ahead of me…I don’t think I could shave off 10 minutes without some serious training. But, the 5th place guy was only 4:30 ahead of me, which means that 7 of us finished within just a few minutes of each other. This gives me hope that with a little smarter start I might have been able to get a few positions up the list and if nothing else it tells me that I’m in the right neighborhood for hanging with my fellow category 3 racers LOL. It was a really fun experience and I look forward to more this summer. 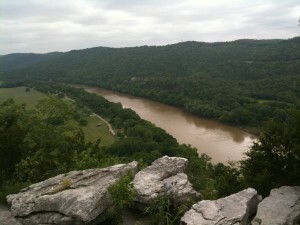 The next race is on my “home trail system” of Castlewood, June 12. If the race bug continues I can see that my 34lb All Mountain rig probably isn’t the best choice for such things…at the same time I have no desire to take my lunch to the gym every day to train for racing like my awe-inspiring cousin. Is there such a thing as recreational racer? For many years (maybe a decade or more!) I’ve been putting photos on my own websites as a way to keep track of my bike riding, jeeping, and family life. The big advantage is that I can do whatever I want, put up as many images as I need, and not have to worry about anyone giving me grief about it. However, eventually it became so large and unwieldy that I just didn’t feel like updating the software and dealing with the headaches that entailed. It became a chore to update photos, and this was not helping encourage me to post photos online. I’m trying Google’s Picasa to see how that works for me. The first Gig is free, which I could fill up in my sleep, but it is 5 bucks for an extra 5GB of space… Once I reach a Gig, I’ll see how I feel about it and take it from there. For now, here is where I’ll be moving my biking photos. Family photos will be elsewhere. When I find a company that performs above and beyond the call of duty I stick with them. And if they consistently do that over the years, I recommend them to anyone who will listen. One of those companies is NewEgg.com, which sells computer components and electronics. Not only do they have the best prices on the Internet most of the time, they have in-depth reviews of products by purchasers which is often crucial in the buying process. But what makes them my favorite online store for this type of gear is their customer service. I’m not sure how long I’ve been a customer there, but its been at least 7 years with my current account. In all that time, with maybe 30 orders, I’ve never been disappointed in the shipping, customer service, or the product when it arrived. In fact, my latest “problem” with them illustrates just how much I’m a fan. Over the summer I pre-ordered a couple copies of Windows 7, which released last week. My credit card was billed promptly, I received an email saying my order was shipping and I sat back happily expecting it to arrive. Yesterday it struck me that it hadn’t arrived yet, which was very unusual delay for NewEgg*. So, I popped onto their online chat system, talked to a service rep and they confirmed a problem on their end which they immediately fixed, and then offered me a $25 credit on my next order because of the delay on this one. It took less than a couple of minutes and a potential negative quickly turned into a major positive. This is outstanding customer service worth sharing with the world! *As a postscript to this story, I chatted with customer service yesterday in the morning. I can see on their order tracking system that my order went out yesterday from TN and is already on the truck for delivery to my house today in MO. This speed is not unusual, and I only mention it for the new people! 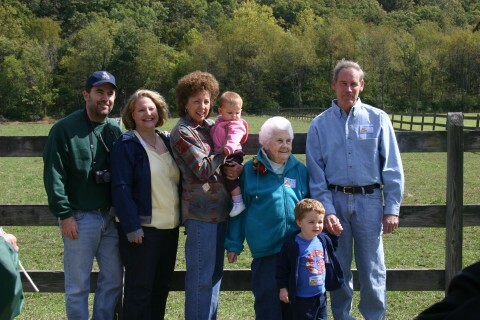 I finally got a snapshot of my other side of the family, showing four generations all in the same place. This time, on my dad’s side – my son and daughter, myself, my dad (and mom), and my grandma. Four generations! This was taken at a family reunion a few weeks ago. I’m amazed at how well my 99-year-old (EDIT: She is now 100!) grandma gets around. I don’t normally get involved in anything political, but in the rare instance where my passion (biking) crosses with political tomfoolery, I have to do something. I want there to be a Tour of Missouri in 2010, but in my view it appears the whole world has assumed the tour will be canned after 2009 – and no one seems to be overly concerned. Today, as the Tour of Missouri 2009 is underway, is when we need to raise awareness and get the Governor on board with saving it. We can only do that by continually reminding him that there are constituents who passionately support this international sporting event. Please consider a brief email to Governor Nixon and tell him thanks for supporting the race this year, but that it would be even better if he could pledge support publicly for the race in 2010. 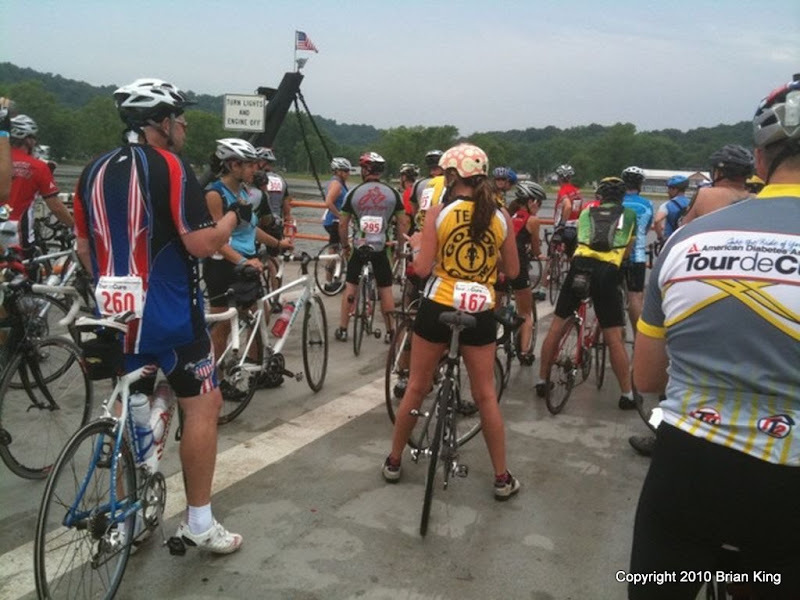 Thank you governor for releasing the funds to bring the Tour of Missouri to our state in 2009. However, now is the time to show support for the tour and publicly state your commitment to bring the tour back in 2010. Not to state the obvious, but the economic impact by all accounts is a net positive, and this will only improve as the tour gets stronger. The strength comes in knowing funding won’t suddenly be cut – which is where you come in. As it is, everyone thinks you will leave the tour for dead after this year, which kills the enthusiasm of future potential sponsors, race teams and organizers, international tourists, etc. This is a self-fulfilling negative prophecy. Please consider making a statement in support of the tour as it is happening this year if you haven’t already. Email Governor Jay Nixon of Missouri. If you prefer to call directly, 573-751-3222. Please ask him to support the tour in 2010. I’m not sure why I even bother, but I just can’t let this rest. The 2009 race is happening right now, and NOW is the time we should be forcing our politicians to make the decision on keeping the race next year. It would show good faith from the state, and remove the dark scythe hanging ominously above this race. Even as the riders toil in the heat of the Missouri outlands – announcers, fans, and everyone else is saying this race is death warmed over…yet I don’t get the sense anyone is particularly concerned or doing anything about it! The press should be constantly in the Governors face this whole week, talking about the good things this race is doing for Missouri this very instant, and get him on record either supporting it or explaining why it is bad for the state to support it. Missouri is on the cusp of losing one of the most positive PR sporting events in the history of the state because they can’t get their act together. I figure investing 1.5M dollars in return for 30M+ in revenues which are generated from having this seven day INTERNATIONAL sporting event would be a no-brainer. Is it politics? Democratic Governor of Missouri wants it dead. Republican Lt. Governor fought like hell to save it this year with an 11th hour rescue. Can it really be that inane? There are three big bike races in the United States, though the Tour de Georgia apparently took this year off as they seek sponsors to foot the bill for 2010. 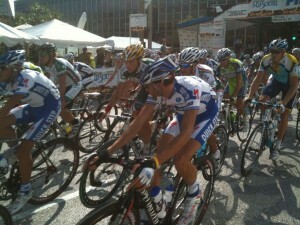 This leaves the Tour of Missouri and the Tour of California with 2009 races. And here we are in prime time in the world’s eyes, and the state of Missouri looks like a bunch of chumps as we bumble around not knowing if the race will be back next year. This hurts potential future sponsorships, this hurts television coverage (why bother if it is going to be canceled next year? ), and it hurts Missouri tourism which is the primary sponsor of this race. 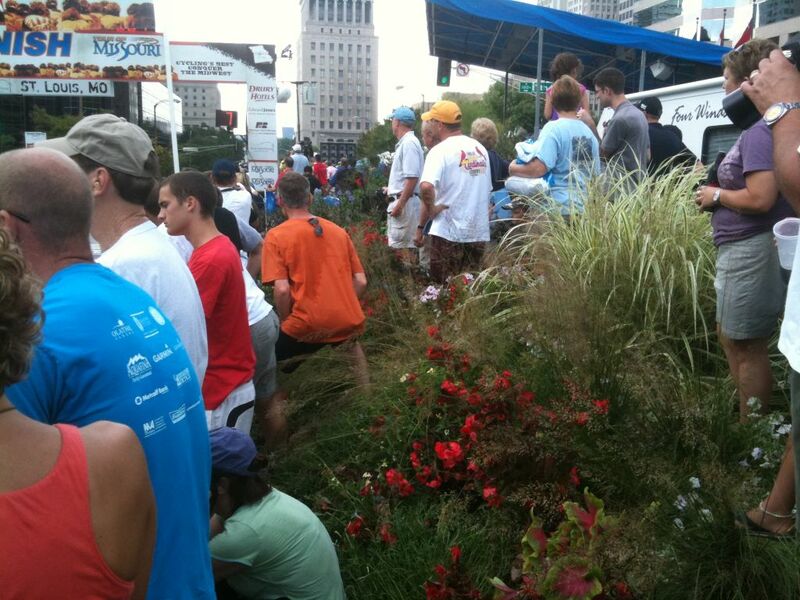 And, in what seems like a continuing series of complaints about the City of St. Louis and race planners, someone got the bright idea to place the start/finish line directly next to a median full of flowers on Market Street. Then the announcers had the gall to berate anyone who was standing in the flower beds! Congratulations – once again St. Louis looks like they can’t get their act together. As you can see from this photo, the flowers are literally next to the start/finish – not somewhere people were standing just to be mean or bad citizens (as was implied by the announcers). Don't stand in the flower beds! I just can’t fathom why it is so important to have the race start and end in such a confined space, with literally 10 feet on either side of the race chute available for spectators. If you aren’t standing on the guardrails for the entire race to protect your spot, you can forget about seeing the finish in real time. I found this out the previous 2 years I’ve been to this race. What this does is force people to hold their spots the whole four hours, rather than mosey around the tents to see what else is there. Is it really that difficult to find some grand stands for people? Why not have some high schools provide stands, and in return let them march their bands in between laps for some entertainment for the crowd? The only entertainment we got was one motorcyclist doing stunts (interestingly enough, he is the only piece of entertainment for three years running). Come on St. Louis, this is the best we can do? One act? This year there were no large screen TV’s showing the race at the finish line like previous years – which meant that once the peloton rounded the corner we had almost no idea what was going on. This was bad. Is it really so difficult to start and end the race somewhere like Forest Park, ideally along a hillside so that spectators could relax, bring blankets, enjoy the park, and see a good race without standing along hot guardrails for 4 hours? Have the circuit go downtown to get your precious face time for the city, but don’t make the fans suffer for it. Better still, have St. Louis be an end point of a stage race, rather than a circuit race. Do a shot downtown, then a few laps through Forest Park for the big ending. I don’t know if anyone has noticed, but the St. Louis circuit race is almost a carbon copy each year. Time to mix it up. Finally, I can say one good thing about this year in St. Louis – the photographers were asked to move back up the road far enough that they didn’t block all the spectators who were trying to see the big finish. In year 1 they were right up at the finish line, making it impossible to see the winning sprint if you were behind them. Not sure where they were in year 2 because I couldn’t see the finish. Definitely an improvement. 1. Improve the start/finish area. Totally unacceptable to pack everyone in on a few small sidewalks, or worse in a half-mile of flower beds, and expect that to be OK. Think this through a bit more next time. 2. There must be TV’s for spectators at the start/finish. 3. Bring in entertainment between laps if there is a circuit race. You are trying to promote tourism. Why not have Fred Bird there? St. Louis Rams cheerleaders. High school marching bands. Allow regular bikers the ability to ride en masse through the start gate to get a taste of the race first hand and get on TV and get their bikes signed by riders later? Surely there are other ideas for entertainment which showcase Missouri that would do it for the positive exposure alone? 4. Have a camera on a roof top so as to capture the look of the peloton as it goes through the gate and as the big sprint happens at the end (since we can’t have helicopters this might be a poor man’s substitute). 6. Politicians need to figure out a way to work together on this. The tourism dollars alone make the decision to support the tour a NO BRAINER! If we throw this away because of politics it will be a black stain on Missouri. 7. Get real time TV coverage. How can an event this big, in our home state, not rate some kind of full length TV coverage? I suspect it is because no one can sell advertising for this event. Well congratulations – that is exactly what wishy washy support from the State of Missouri will do for you. No one is going to pay for advertising on an event that no one knows is going to be around almost up until the time it happens! 8. Talk to Lance Armstrong. If you can get him interested in having his Livestrong foundation have some role in the race, even making his group a prominent co-sponsor at no cost, the publicity alone will bring in tons more spectators. Lance could single handed-ly save the Tour if the Missouri folks could play it smart. I love the fact that Missouri has this incredible opportunity, and I fully expected the race would be canned this year. I’m impressed that even at the late hour the race was saved, we were able to get seven professional racing teams to show up (we had 3 last year apparently). Kudos to race organizers for doing the best they could with the time they were given. The race has lots of potential, even as other races fall from grace (Georgia). But if Missouri blows this because of petty politics I’m going to be very disappointed in our elected representatives. Not surprised mind you, just disappointed.